I’ve spent a lot of time in the hotels, restaurants and villas of Los Cabos and one of things I constantly notice is the incredible detail that goes into the interior design. One of the places that this is perhaps the most visable is in the luxury villas and condos. Communities like Pedregal, Palmilla and Esperanza are full of homes and second homes that are impecable in their design. Recently, I got the chance to sit down with Paulina Gutierrez of Casa Paulina and chat about the interior design business in Cabo. 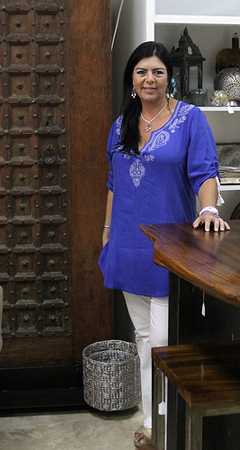 She’s an interior decorator who has had a design business in Los Cabos for over 25 years. Paulina does a lot of custom work and has two retail stores: one in downtown San Jose del Cabo and one in the Shoppes at Palmilla. Her stores are full of hand-picked selections that piqued my curiousity and of course, her beautiful antique door collection. I was also interested in the decorating style of Los Cabos (I love luxury villas) and what led Paulina to the bottom of the Baja Pennisula. 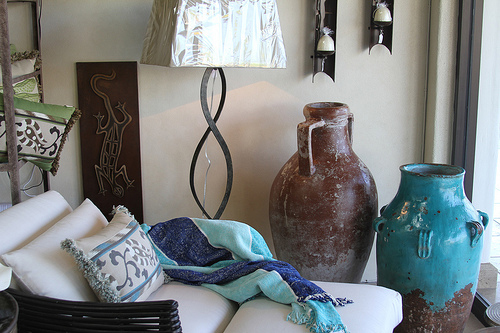 How would you describe the decorating style of Los Cabos? Most clients want the Spanish influence – heavy carbons and heavy fabrics. However, we are starting to see more wanting a contempory feel with lots of open areas. Little by little I see a transition. You decorate for a lot of other people. But what is your personal style? My personal style is contemporary organic. I just finished decorating my house. It’s very square with no arches. The windows are all aluminum frames – no wood. The kitchen is white with stainless steel. I added organic pieces of furniture. I have an organic shaped one of a kind dining table. It’s all very clean and simple. All my pergala (verandas) are local palapa material. The inside of the house is more contemporary . Very natural colors like off white and sands. I started when I was a teenager. My mom had an interior design company in Mexico City and I helped her around the house. My mom was very organized and focused. And she taught me to be the same. What brought you to Los Cabos? I came to Los Cabos in 1989 with some friends who moved here. What was Cabo like back then? It was a small quiet, clean beautiful town. Life was very slow. Everyone had a lot of time for themselves. It was the most beautiful place. It wasn’t developed very much. Most of the hotels used to close during the summer. I went to the beach every single day. What decorating and design services do you offer? I do everything from decorationg model houses and units – “mini houses” – for major developments to smaller projects like re-upholstery. Everything is customizable; our main business is custom. We do a lot of custom art. And my retail stores of course. We have two locations. Our main location is downtown and this new location in the Shoppes at Palmilla. The retail stores are great because people can just walk in and buy a gift or accessories. We always have great lamps, Christmas gifts or even house warming gifts. We can pack it nicely for travel or ship it to you. A lot of your clients are second home owners. Do you work with clients long distance? Yes. Actually, I worked for my first client long distance. He had bought a place in Los Cabos and couldn’t come down. He contacted me and I started to work with him to find out what needed – furnishing and interior design. When he arrived, everything was ready. Back then there were no emails and we had to do everything over the phone. It’s a lot easier now to do long distance consultations. Technology has changed my life completely. I used to be a slave to my phone or my store, but with technology I can make a deal and the client doesn’t need to know where I am. I can be traveling, buying art and shoot a picture with my Blackberry. I can then email my client and they can look at the picture and say yes or no in 3 seconds. This has allowed me give better service because I can always be there. I’ve also helped clients do their houses in the States or other places. They send me pictures and we do rendering and send the art. Where do you get most of your items for decorating? My husband says I really never stop. Even when I was on honeymoon, I was shopping. I find things every day every place. I do some purchasing trips and exhibitions. But it never really stops. You’ve traveled extensively throughout Mexico. Where would you recommend someone visit to find some treasures? To find hidden treasures, you need to go to the towns. You need to walk the towns and talk with the artisans. One of my favorite places is Chiapas. My mom is from Chiapas so I’m very familiar with it. Every time I’m there, I discover something new. 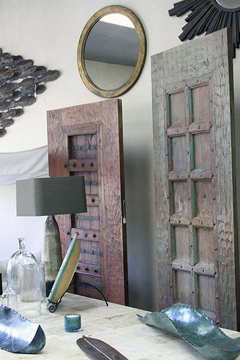 Can you tell us about your antique door collection? Actually, my first door was Mexican. It was a piece that we found and it’s now the main gate for Casa Paulina in San Jose del Cabo. We liked the idea so much that then we did a big import from India. We imported like 200 doors! Now we have doors from all over and a lot from Mexico. An antique door can change the whole atmosphere. We have done a lot of houses where we switch the doors. We also do custom carved or metal doors. 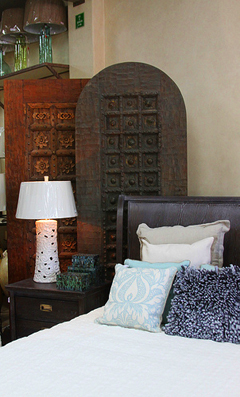 The antique doors also make interesting coffee tables or headboards..
Do you have any decorating tips for our readers? Don’t over do it. So often I come to a place on a consultation and its over done. Keep in mind that less is better. 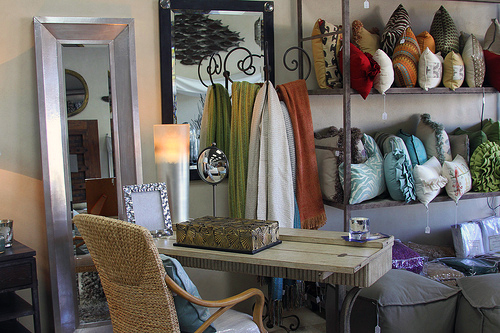 Paulina’s stores are full of magical items that scream to be the next “Where did you get that?” piece in your home. Where did you find your favorite treasure?